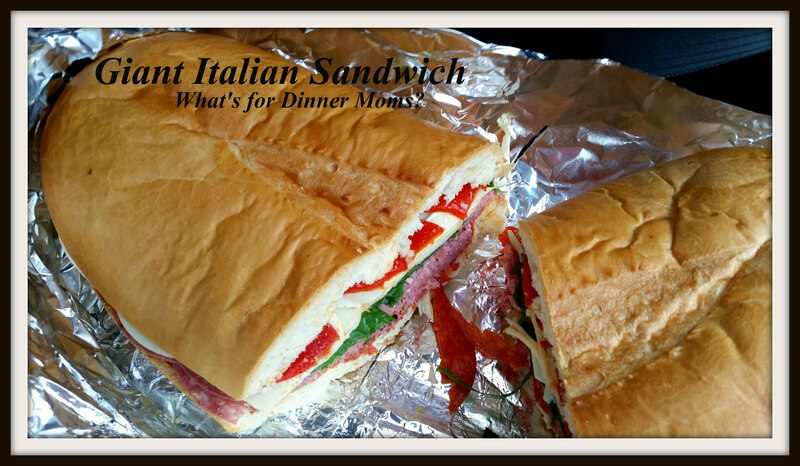 Giant Italian Sandwich – For Home or To Go – What's for Dinner Moms? I haven’t talked much about our To-Go meals this year. We are coming back into the time when we will be having more of our meals on the go. This past Friday we were headed Lansing for the Michigan State Science Olympiad so I decided it was time to pull out one of our favorite meals, the Giant Sandwich. We love this meal because it is simple and we don’t eat sandwiches very often. Mostly our lunches are soups, leftovers, or salads. So, when we do have a sandwich I try to make it super special not ordinary. Add something unexpected to it. This sandwich had baby spinach and roasted red peppers. Sometimes I will even add an olive tapenade to the bottom of the sandwich. The only problem with a sandwich like this in the car are the crumbs! If you are bothered by crumbs then this is not for you. Go for a firmer, less crusty bread. When we got home a quick trip through the car wash and a vacuum after cleaned the car right up. Cut the loaf of bread horizontally and then remove any extra bread to better balance the loaf between bread and stuff for the sandwich. You want to make like a little boat in the bottom to hold the sandwich stuffing. Layer salami, pepperoni, cheese, spinach and peppers on the bread. Wrap in aluminum foil and place in cooler or refrigerator until 15 minutes before serving. Remove sandwich from cooler or refrigerator and unwrap. Allow to sit for about 15 minutes before slicing. Add creamy salad dressing to sandwich before serving. Previous Post Chicago – Blogapalooza Event! Definitely sounds like a good traveling meal! Shame though that my son could, and would eat one by himself lol! Lol! I have one of those too. We cut him off after 2 slices. great entry. we don’t eat sandwiches much either but for a special occasion its fine and hungry bellies are grateful. Thank you. Chicken noodle is always good for a crowd – simple and basic that most people like. I like Lasagna Soup because it has tons of flavor and with a dollop of ricotta cheese on top with a bit of black pepper it is delicious! Both are simple to make in a slow cooker or large stock pot. Wow, this looks absolutely delish! has all the best ingredients! TY!! This is a great sandwich and I absolutely love them. Wow. That looks like it would be a good picnic food too. Just make one ginormo loaf full of fixings and you’re good to go. I don’t eat sandwiches, but this does look good. Thank you. I rarely eat sandwiches but when I do I want something with lots of “stuff” on it.